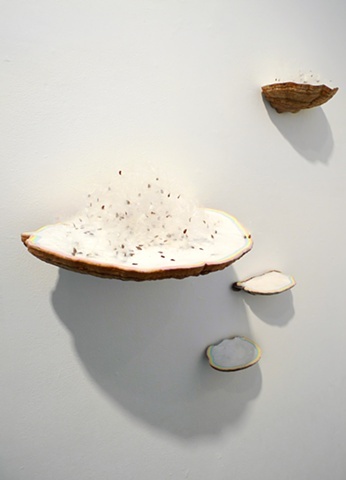 Through the duration of the exhibit, the seeds gradually drift from the fungus platforms, floating through the air and landing on viewers. The work was created after reading nature writer David Quammen's excellent and weighty tome on island biogeography, The Song of the Dodo. Now known as insular biogeography, the theory was one of the first attempts to bring mathematical modeling to ecology, and is an important field within biogeography which examines the factors that affect the biodiversity of isolated natural communities, such as islands, conservation areas, parks, preserves etc. Robert MacArthur and E.O. Wilson developed the theory in the 1960's at a critical time for conservation science, prior to MacArthur's untimely death. Wilson, still working today in his late 80s, would go on to become one of the most revered biologists of his time, working in fields from the micro (myrmecology, the study of ants) to macro (evolutionary biology). See a close-up detail of the work in Solastalgia here.